Donatello (Donato di Niccolò di Betto Bardi, c. 1386 – 13 December 1466) was an Italian sculptor during the Renaissance. He lived in Florence. He worked in stone, bronze, wood, clay, and wax  with several assistants. His reputation as a great artist was stated by Vasari, and has always stood well. He worked in Rome, Sienna and Padua as well as Florence, and worked for the Church, for Cosimo de' Medici, and for various city authorities. ↑ Schneider, Laurie 1973. 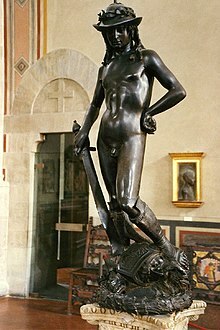 Donatello's bronze David. The Art Bulletin, 55, 213–216. ↑ Janson H.W. 1957 The sculpture of Donatello. Princeton University Press.